Here’s a feature article from the Minneapolis Star Tribune, published in January 2006. With materials from the tundra of Siberia, the oceans of Asia and the rain forest in Brazil, a Minnesota artist creates fine violin bows. NORTHFIELD, MINN. — If your heart soars at the strains of Handel’s “Messiah” or Bach’s “Christmas Oratorio” this year, say a silent thank-you to the Siberian stallion, the Brazilian pernambuco tree and the artisan whose gifts made it possible for those strings to sing. Matthew Wehling is one such artisan. In the no-frills basement of his 1903 house in Northfield, Wehling crafts award-winning bows for violins, cellos and violas. Musicians pay as much as $5,000 for a Wehling bow. 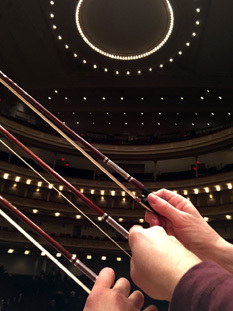 Only about 35 full-time professionals make bows in the U.S., about four in Minnesota. 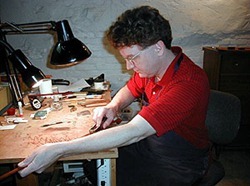 Like most, Wehling crafts each bow by hand — and even makes some of his own metal planes and knives for shaving and carving them. The reddish wood for bows comes from Brazil, bits of decorative shellfish from Asia. He uses Siberian horse hair because it’s straight and tough, and he meticulously sorts it, hair by hair, tossing out as many as half that are not quite right. A bow must first be functional, a tool on which a musician can rely. But there’s another aspect, one on which Wehling places great emphasis: the bow as an object of beauty. What Italy is to violins, France is to bows. Wehling studied bowmaking in France for five years, then came home to Minnesota in 2001 with a French wife and their baby boy. He said he knows of only two or three other Americans who studied French bowmaking as intensively as he has. Heifetz didn’t. Wehling vows not to. Wehling, 43, grew up in Cottage Grove, the youngest of four boys. He graduated from the University of Minnesota and worked as a chemist in the medical-device field for seven years. For fun, he played mandolin (his primary instrument), guitar and a bit of violin. In about 1990, he picked up his unlatched violin case one day, and the instrument came tumbling out. The neck was severed from the instrument’s body. That led to thoughts of violin repair, or maybe violinmaking. But, never one to follow the pack, Wehling considered instead bowmaking. He likes working with his hands on intricate work, and he loved the idea that something so seemingly simple as a violin bow has so many layers of depth. Bowmaking, he realized, was something in which he could be immersed for a lifetime. After studying at several bowmaking workshops in New Hampshire, he made some phone calls to France. A master, Benoit Rolland, told him, “Come over. I’ll teach you to make bows.” No pay, but tremendous learning potential. Wehling spent another year as a chemist, packing away money to follow his dream. After eight months, another celebrated bowmaker, Georges Tepho of Quimper in Brittany, took him as an assistant, and that lasted almost five years. One day, when he’d been in France about three years, he spotted the woman who was to become his wife: “Christine had a cool dog, a well-behaved dog. With the help of dog biscuits, I eventually was able to get the dog interested in me, and the woman followed.” She, too, is an artist, trained in Paris to make exquisite book bindings. His bows are more supple than those of most American bowmakers. That suits some musicians, others not, he said. The work is largely solitary. Bach is on the CD player. Or Irish fiddle tunes. Or the Rolling Stones. But lots of times, the basement is quiet. Wehling wants a bow to look as if it was created by a force of nature, as if water ran over the stick for a million years to curve it. Instead, he heats a section of a straight stick over a small alcohol lamp, bends it a bit over the corner of his workbench. Reheat, bend, reheat, bend, until it’s just how he wants it. He buys the pernambuco wood in boards and lets it dry at least a year. Then he cuts it into “blanks,” roughly the shape of bows, and lets it rest, preferably for another nine years. Occasionally he finds a knot or just feels a piece of wood is not accommodating. Then the stick goes to the garden for a new life as a tomato-plant stake. Most weeks, he works about 48 hours. Christine has put aside bookbinding to train horses. The Wehlings’ son, Paul, is in kindergarten and their baby daughter, Marie-Louise, is crawling. One habit from France has held over. The family sets aside two hours for lunch, conversation and perhaps a nap.